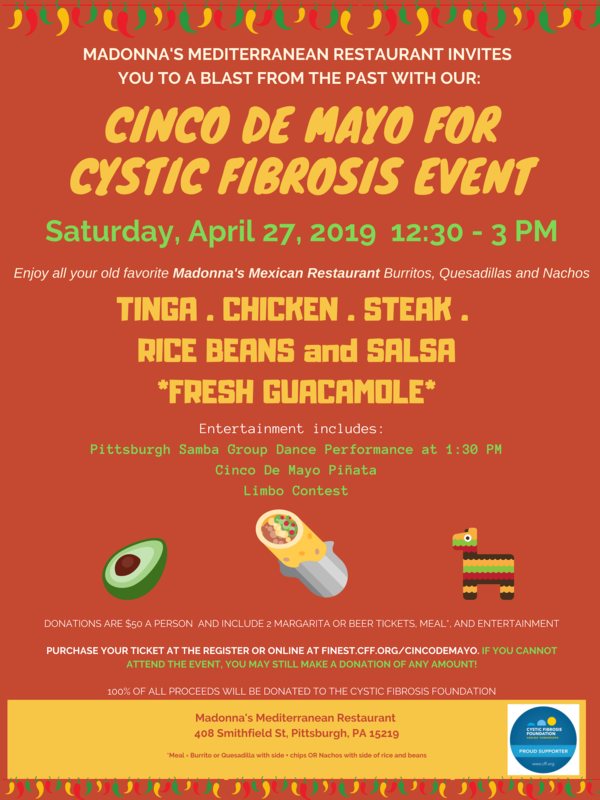 Madonna's Mediterranean Restaurant invites you to a blast from the past with our Cinco De Mayo for Cystic Fibrosis Event. Come and enjoy all former favorite Madonna's Mexican Restaurant Burritos, Quesadillas, and Nachos featuring tinga (shredded marinated chicken) , grilled chicken, steak, and fresh guacamole. Entertainment will include a dance performance featuring Pittsburgh Samba Group, a Pinata and Limbo Contest. Donations are $50 per person and include 2 beer or margarita drink tickets, meal, and entertainment! Those with CF have an average lifespan of 37 years so help us help the Cystic Fibrosis Foundation forward their mission to find a cure!